The time change and weather has not bode well for getting good pictures outside. I’ve put off this post waiting for a good picture, but have decided if I don’t record details now, I’ll forget them. My Orange Crush was started April 1, 2008 — well at least that’s when the first clue was released. I finished up the top 7 months later on November 4, 2008. The quilt top needed to age – waiting for the perfect occasion to gift it. I quilted it on October 26, 2015 using Superior’s So Fine! #722 “Crikey!” in the top and pre-wound SuperBobs in white for the bobbin. The quilting pattern is Curley-Q, a pantograph by Aimee Mahan. The batting is Hobb’s Tuscany 100% Bleached cotton. Finally I bound it using Susie’s Magic Binding. After washing the quilt measures…well shoot, I don’t have that information in the spreadsheet. I’ll have to come back and add it before it is gifted. This was an October 31, 2015 finish – pulling it out of the washing machine that morning in time to be included in the November UFO Parade Aunt Marti’s 52 Quilts. It was also counted as a finish for the UFO Busting Report sponsored by Vicki over at Field Trips in Fiber. It is one of my finishes for the 2015 Finish Along off my 4th Quarter List and finally it is one of the Crazy Challenge II quilts. 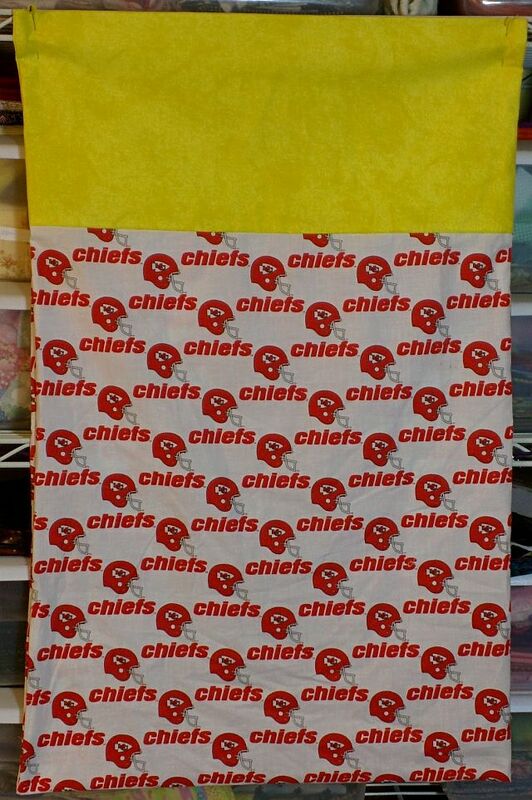 I didn’t mention it, but the backing is the same Kansas City Chiefs fabric that I used for the pillowcase. I remember you working on it at retreat in 2008! I know you’re glad it’s finished and it’s a great looking one too. Did Bonnie used to do her Mysteries earlier than Black Friday? Nice to get it done after all these years. Hope the person getting it appreciates the time it took to make it. 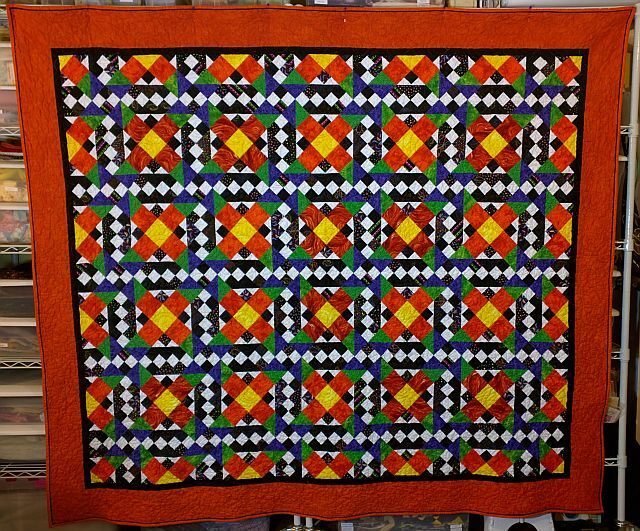 Must feel good to get this one finished and it is such a bright quilt it will feel very warm in the house it goes to! Thank you for participating in the FAL, on behalf of the 2016 global FAL hosts.